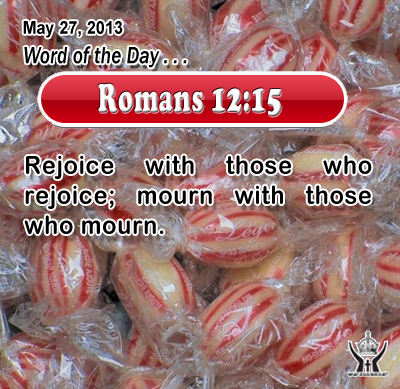 Romans 12:15Rejoice with those who rejoice; mourn with those who mourn. Loving Father, lead us to the people today who need their burdens lifted and their joys shared. Let us be your presence in the world of your children today. This we ask in Infant Jesus name. Amen. 28Peter began to say to him, "Lo, we have left everything and followed you." 29 Jesus said, "Truly, I say to you, there is no one who has left house or brothers or sisters or mother or father or children or lands, for my sake and for the gospel, 30 who will not receive a hundredfold now in this time, houses and brothers and sisters and mothers and children and lands, with persecutions, and in the age to come eternal life. 31 But many that are first will be last, and the last first." Lord Jesus, we want to follow you as your disciple and to love you wholeheartedly with all that we have. Fill our heart with faith, hope, and love that we may always find peace and joy in your presence.